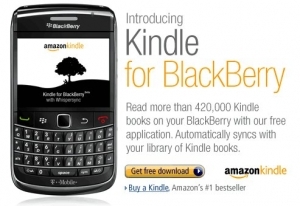 Amazon releases Kindle for BlackBerry | BlackBerry Blast! If you've been over to Amazon.com today you can't miss the fact that they've released Kindle for BlackBerry. Interestingly, it's only available to customers in the US. The features in the current version of Kindle for BlackBerry follow, but Amazon has already announced future features to include scrolling, search, and creating notes and highlights. Search and browse more than 400,000 books, including 101 of 112 New York Times� Best Sellers.